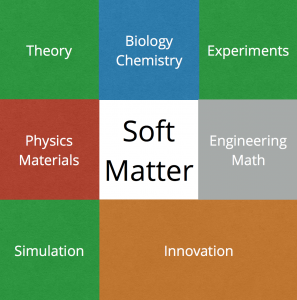 Soft matter is an interdisciplinary field that includes disciplines such as Engineering, Physics, Biology, Chemistry, Materials Science, and Mathematics. A particular area of interest to the UPRM Soft Matter Collective is the understanding of how the deformation of materials with multifunctional and/or reconfigurable properties correlates to their fundamental composition and structure. This effort is key to properly place in context the operative forces that govern these materials at different length and time scales and acquire a necessary guidance to continue finding underlying principles that connect them. The investigators of this Collective are challenged with fundamental questions such as: What causes these materials to deform or flow? What forces operate depending on the relevant length scale? Why do some materials deform faster than others? What similar features are found between synthetic and biological materials? What makes a soft material reconfigurable and multifunctional? How does modifying their surface chemistry change their bulk properties? And how are these novel properties incorporated into current materials? All these fundamental questions are addressed via experiments, theory and simulations. Ultimately, our efforts will translate into innovative products to address important global challenges. Colloidal suspensions are many-body systems composed of tiny (nanometer- to micrometer-sized) particles, typically named colloids, dispersed in a continuum medium. Colloids are used as model systems mainly because of the following features: 1) colloids and other macromolecules share similar length scales, which renders them ‘visible’, and, as a consequence, they are subject relatively slow physicochemical processes (typical time scales 1 μs – 1 s); this characteristic opens the possibility to follow colloidal dynamics and transport processes in real time, 2) colloidal suspensions can be studied on a single-particle level by means of different complementary techniques, i.e., experiments, computer simulations and theoretical approximations, 3) the interactions between colloidal particles, of the order of the thermal energy, also describe the interaction between macromolecules immersed in an aqueous environment and can be tuned in a broad range, and 4) since colloidal interactions are relatively weak, they are highly susceptible to external forces and their static and dynamical properties can be controlled through the application of external fields. Thus, colloidal systems open up the possibility to explore a large diversity of phenomena, such as directed self-assembly and structure formation, to answer fundamental questions within the statistical physics of non-equilibrium states. 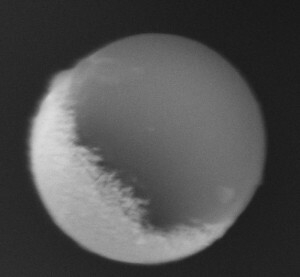 The understanding of the physical properties of colloidal suspensions allows us to give a qualitative, and often quantitative, description of soft materials, but also to attack problems in the context of biophysics and other areas of science and therefore has implications in hard-condensed matter, chemistry, materials science, biology and biotechnology. It therefore facilitates the quantitative prediction of important physical properties for the manufacturing, fabrication and processing of commercial products, i.e., technological innovation, based on colloidal soft matter. In particular, the UPRM Soft Matter Collective studies self-assembly and non-equilibrium processes, anisotropic colloids, and driven/active matter with multifunctional and/or reconfigurable properties in order to elucidate the correlation between microstructural deformation and their dynamics and fundamental composition. Everybody is familiar with bubbles in one way or another. They are part of our daily lives and look simple, however bubbles are quite complex systems with an intricate physics behind their behavior and even existence. The science of bubbles has developed to a point where they are successfully used for cleaning, cutting, improving contrast in ultrasound imaging and medical treatment for lithotripsy just to cite a few. Additionally, research on their applicability for cancer treatment, drug delivery and to prevent decompression sickness (DCS), among others, is being actively explored. However, there is still serious lack of knowledge on their dynamics that is preventing a wider range of possible applications to develop. Moreover, very recently the research area has been challenge with the tiniest version of bubbles: nano-bubbles, which do not follow the theories applied for larger ones. Actually, they should not be stable for more than milliseconds, yet they are found stable for months. For example, at the Bubble Dynamics Laboratory of the UPRM, cutting edge research is being conducted for understanding, producing and characterizing milli-micro- and nano-bubbles. Specific research is being carried out for DCS treatment and prevention, nanoparticles production and basic knowledge on the bubble dynamics. Polymers are defined as long chains composed of repetitive units. Biopolymers are thus polymers that are natural or synthetic in nature that interact with a biological system. These are commonly found in many applications including, drug delivery devices, adhesives, sutures, vascular grafts, artificial skin, scaffolds, medical tubing, etc. There is an immense variety of biopolymers from DNA, proteins, and carbohydrates, to polyanhydrides, nylons, and hydrogels. However, the main challenge in the field is to engineering a biopolymer to perform for a particular application with a minimal host response. This is known as biocompatibility. It is therefore the focus on biopolymer research to understand the relationship between the physicochemical properties of the material with performance and biological response. In our campus there is research related to the design of drug delivery devices, scaffolds, biochips, microfluidic devices, and biosensors. 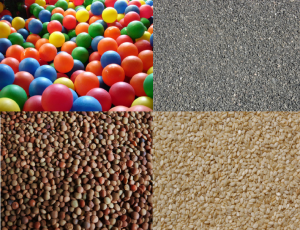 Granular media are everywhere around us, from sand, cosmetics, and edibles to aggregates from smaller particles. They are used commonly in industrial settings for the manufacture of pharmaceutical products and food. 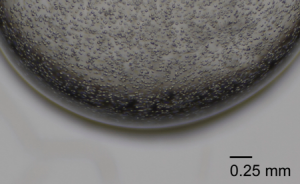 Unlike colloids, granular media can overcome viscous forces and thermal fluctuations via inertia. 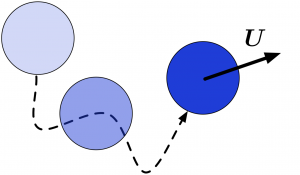 The dynamics of the particles follows Newton’s equations, with forces between particles that are non-zero only when there is a contact between particles or boundaries. Because collisions between particles are inelastic then the energy of a granular material is a dynamic quantity. Although granular materials are very simple to describe they exhibit a tremendous amount of complex behavior, much of which has not yet been satisfactorily explained. At UPRM, investigators in this field conduct experiments and simulation to comprehend the dynamics of aggregation in granular media and the process of encapsulation in cylindrical confinements. Active soft matter includes a wide range of length scales – molecular motor protein to microswimmer bacteria to flocks of birds or fishes. Utilizing the continuous free energy from the surroundings and converting those into directed motions, active matter shows atypical non-equilibrium phenomena both in single and collective level as compared to traditional Brownian systems. Well-constructed thermodynamic frameworks in equilibrium scenario like temperature, pressure, chemical potentials, etc. are also ambiguous in active matter. While a collective ongoing research effort is being made to address these issues, parallel attempts have been taken to mimic active soft matter synthetically in labs like synthetic microswimmers of different shapes and surface functionalities. By making local gradient of different fields (e.g. thermal, concentrations, electronic etc.) due to their asymmetric functionalities in the surfaces, synthetic swimmers can move autonomously. Parallel theoretical and computational researches are also going on to rationalize and elucidate fundamental physics and microscopic mechanisms of these intriguing phenomena. Research groups on active soft matter in UPRM address a wide range of problems along this line of research by utilizing state-of-art computational and theoretical tools which includes Brownian dynamics, Stokesian dynamics, statistical mechanical and hydrodynamic theory, and molecular dynamics. Among the current research interests, studying the cluster behaviors and dynamics of active patchy particles, pair- and collective-level self-diffusiophoresis in the proximity of solid walls considering the mechanisms explicitly, tracer diffusions in active suspensions, active particle physics in presence of soft and flexible viscoelastic polymers and their rheology are the most significant to say the least.